Gutter Solutions Plus, was established by two associates of Gutter Helmet with over 25 years experience each in the Gutter Helmet industry. Talents were merged to create Gutter Solutions Plus. We specialize in the Permanent Solution to keep your gutters free flowing and are locally owned and operated. Through our commitment to customer service, integrity and never sacrificing quality, we are one of the top gutter protection companies in the greater Atlanta area. Our goal has always been and will continue to always exceed customer’s expectations with installs and service. 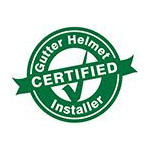 We are thrilled to continue and combine our experience with Gutter Helmet, the most trusted name in gutter protection, and continuing the authorized exclusive dealer services that have provided to the greater Atlanta area for over 25 years. Gutter Helmet is the innovative leader in gutter protection, backed by a Billion Dollar Publicly Traded company, awarded 7 design patents, offers a Triple Lifetime Transferable Warranty and installs over new or existing gutters. We are a full service gutter company that installs the very best gutter protection system available. Every home needs gutters, and those gutters need Gutter Helmet! Call us today to learn more or to receive a free quote. If you have dealt with all the rest, try the best!